Halloween is fast approaching and I feel a little bit behind in terms of being organised this year. The girls have been making Halloween crafts of some description in preschool which they are very excited to show me when they get to bring home their art folders, before the mid-term break. They are also full of chat about what they are dressing up as, which is wonderful and all, but they keep changing their minds every five minutes. I think all decisions will be made very last minute and cobbled together out of whatever we have around the house. Which is probably how it should be. Despite my grand plans to make her a Batgirl costume (well, a cape, at the very least) Sábha seems to have lost interest in that idea and now wants to be a bat. Or a cat. Or a witch like last year. Or a pumpkin. Or whatever costume she sees in shop windows on any given day. Lile will, most likely, be a princess (again). Or a cat. Or a princess cat. That girl knows what she likes. I have grand plans of cracking open the craft stash and getting creative with the girls, but I know that realistically I'd be better holding off until the midterm break when we're bound to be trapped indoors due to inclement weather and I'll have to find something to entertain them. I have a few new 'spooky' ideas but I will definitely be revisiting some of last years crafts too. I really want to try out Dr. How's Glowing Monster Slime recipe. I think the girls would really enjoy it. It looks very cool. I'd also love to try out her fake blood recipes, but I might have to figure out a substitute for the peanut butter as Sábha is allergic to it! I think this adorable Unicorn costume would be handy enough to put together at the last minute and I know Sábha would love it. So I have this idea in reserve and all I'll have to do is scale up one part of my felt unicorn pattern! I owe a few people some snail mail and I'm super-inspired by this gorgeous Halloween Happy Mail. I'd love to be able to create such pretty post! These Woodland Creature Masks deserve a mention because they are so lovely. And there's a fox included. I think I might like to make these anyway, to keep in the dress-up box. I've spotted (and maybe sampled) Báirín Breac in the shops, but I'm always on the lookout for recipes to try at home. I do have a version I've made a few times with great success (which I'll share if you're interested!) but I might just give this version a try too. Oh! I should also mention that I wrote a piece for the popular MyKidstime site recently, which I'm thrilled with the response to. 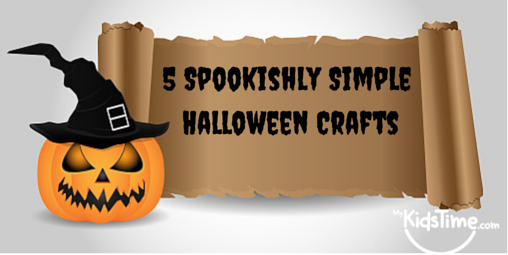 Do stop by and have a look at my 5 Spookishly Simple Halloween Crafts if you are in need of something fun to do over the mid-term break. I have another 'spookishly simple' project I'm dying to put together over the next few days, so make sure to check back and see if I've gotten around to it! Are you all set for Halloween? Or are you like me - full of ideas and no time to get to them?! Oh what a lovely surprise to be reading through this post only to see I have a mention :) Thank you! There are plenty of other options for the fake blood recipe that you can definitely leave the peanut butter out. Try golden syrup, red food colouring, cornflour and chocolate syrup or maybe ribena, golden syrup, green food colouring and cocoa powder..... or mix the all up for even more fun! ENJOY! I do hope Sábha chooses the unicorn outfit I would so love to see what you create.